What’s next? That’s the question at the core of a lot (though not all) of science fiction. And though there’s no talking about the future without really talking about the here and now, a genuine interest in and concern for the future of humanity pervades the genre. Why did this forward projection develop when it did, after centuries of literature set firmly in the past and present? No doubt the huge advances in science at the end of the 19th and 20th century played a part. So did genre momentum. Elvis, Carl Perkins, and Chuck Berry (and others, of course) started making rock ’n’ roll, and suddenly everyone had a guitar, some blues riffs, a pounding rhythm, and a song to sing. Why should it be any different with Jules Verne and H.G. Wells? But I’d put a lot of the credit squarely on Charles Darwin’s shoulders. It’s hard to overstate the cultural impact of Darwin’s theories. It isn’t that everyone before Darwin believed that Earth had only been around for a few millennia, but few people provided compelling evidence that we should believe otherwise, either. But with evolution, humanity had to confront the idea of history stretching back further than the mind could easily contemplate, and a universe that stretched further still. It dovetailed with a growing, and widely evident, religious skepticism. Post-Darwin, creation unfolds at an immeasurably slow pace, always subject to the brute laws of nature. Even the clockmaker Creator of the 18th century Deists looks hands-on by comparison. Maybe there’s room for God in this new order, but it gets harder and harder to see where that room is situated. Is there a better combination for a cultural crisis? How about compounding it by letting science give humanity the ability to destroy itself? That’s what Theodore Sturgeon was looking at when he wrote More Than Human, in which evolution and the end of humanity figure prominently. Remarkably, he uses both to point toward a better tomorrow, although he doesn’t get there the easy way. In Sturgeon’s world, evolution is a messy process, a trial-and-error affair whose errors leave confusion, and sometimes bodies, in their wake. Divided into three sections that build on each other—the book is itself something of an evolutionary process—More Than Human opens with “The Fabulous Idiot,” wherein we meet most the book’s key players, young people with extraordinary gifts that set them apart from the rest of humanity. (You can bet that Stan Lee and Chris Claremont had this on their nightstands at some point.) These include the idiot of the title: Lone begins the book as a barely verbal wild man whose life is changed first by the care of a friendly farm couple, and then later, and more profoundly, by some kids. 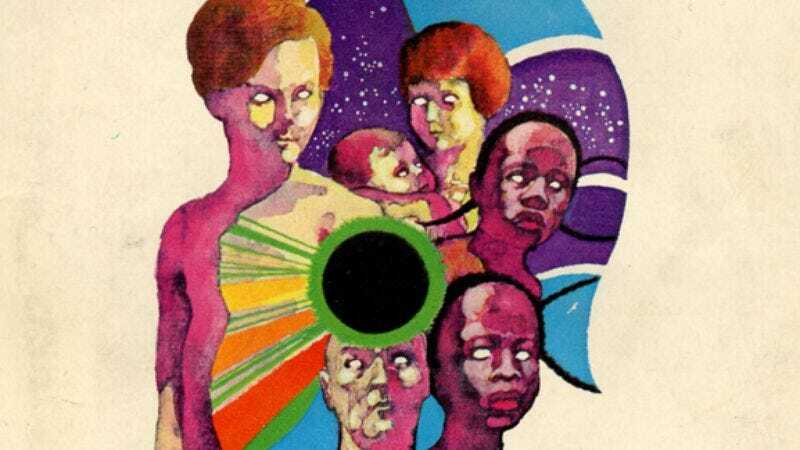 Among them: Janie, a telekinetic girl; a pair of teleporting twins named Bonne and Beanie; and a baby whose physical deformity hides the mental powers of a supercomputer. Put another way: With great power comes great disappointment. Now would be a good time to talk about Sturgeon’s writing style, which is simultaneously rich and tricky. I’ve read More Than Human twice now, and both times have felt a little adrift. And both times, it took me a while to realize I was supposed to feel adrift. It isn’t like he’s engaging in As I Lay Dying-like stream of consciousness, but Sturgeon continually bends the story so we rarely know more than the characters know at any given point. Lone spends a good portion of the first section working on a device that’s never thoroughly described. Sturgeon only fully reveals his character’s handiwork, and its profound implications, in the third and final section. Sturgeon withholds a lot. Each new section almost seems like it belongs in a different novel, until it becomes clear that he’s writing about the same world from a different angle. In the second part, “Baby Is Three,” an extended therapy session reveals the role that a similarly gifted and dangerous kid plays in the homo gestalt. The third section, “Morality,” seems more detached still, exploring the relationship between a now-grown Janie—whose name we don’t know for quite a while—and Hip Barrows, an army lieutenant suffering some kind of profound, mysterious trauma. My spell-check doesn’t recognize the word “unkindled,” but new coinage or not, I can’t think of a better word in that context. Here’s another neologism: “blesh,” a combination of “blend” and “mesh” that Sturgeon uses to explain how homo gestalt works together toward a common goal. Let me use it, too: In More Than Human, Sturgeon’s command of language ideas bleshes perfectly. When I get frustrated with the flat psychology of some of the books in this box, it’s because Sturgeon and others have shown that playing with concepts doesn’t mean sacrificing lyricism and insight. More Than Human is one of the few books in the Box Of Paperbacks I’d read before. I liked it quite a bit the first time, and I’ve been saving it until some point relatively late in the project—and we are getting toward closing time—when I wanted a sure winner. (In retrospect, maybe I should have sandwiched it between some of the Lensman books to come.) If anything, I think I appreciated it more this time, both for its compassion for freaks and misfits, and its ability to see, in their mutations, a way to the future.